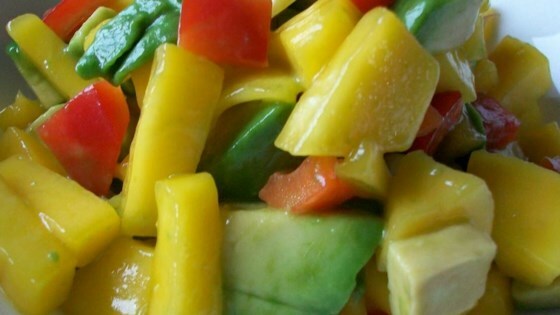 Toss together mango, bell pepper, onion, sugar, olive oil, and vinegar in a bowl. Gently fold in diced avocado, and season with salt. I added a seeded & minced jalapeno to the recipe and served it over red snapper. HEAVEN! I love this recipe! I add corn and black beans and serve it with Jerk shrimp and scallops in soft torilla. It's always a hit and tastes so fresh. tangy and sweet! I served it with plantain chips which complemented the salsa well.